I used the Painted Harvest Stamp set, that worked perfectly with these colours. 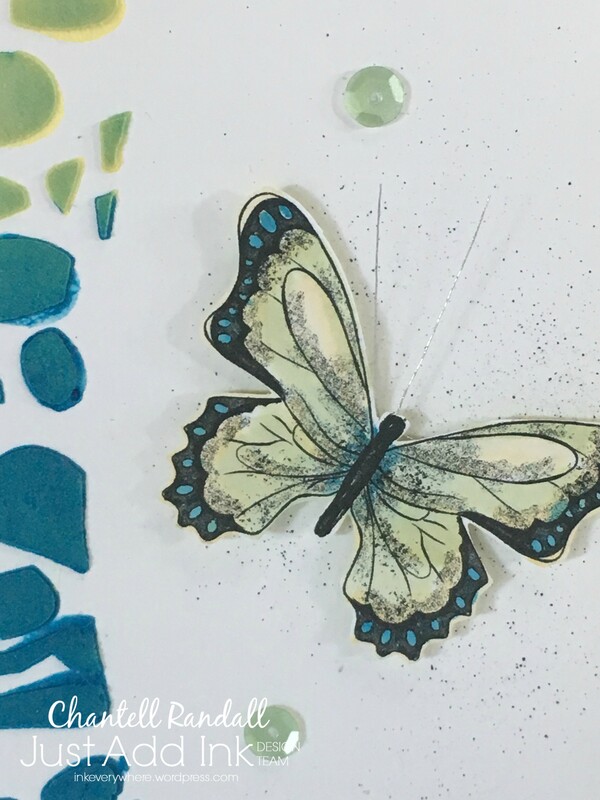 Here’s the link to Just Add Ink so you can join in this Challenge too and check out all the other Design Team examples using these summery colours. The new Just Add Ink Challenge this week is Easter themed and perfect for some long weekend crafting. Jan has provided us with a “Choose Two” Challenge. You can choose out of Bunnies, Flowers or Crosses. 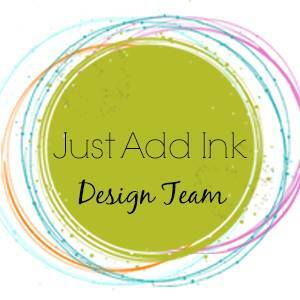 Although I am not participating in this Challenge – because I am away from my craft room, you can check out all the Design Team projects at Just Add Ink. And you can play along with the Challenge too – enjoy! So what have I been up to this week??? I’ve had a super week – work, sight-seeing and some Crafting……. One day during the week I worked in a place called Amersfoort. Amersfoort is a city in the province of Utrecht about an hour or so by train from Rotterdam. I finished work a little earlier than expected so I decided to check out the sites. The Onze-Lieve-Vrouwentoren (Tower of Our Lady) is one of the tallest medieval church towers in the Netherlands at 98 metres (322 ft). When it was built, it was the middle point of The Netherlands. The nickname of the tower is Lange Jan (‘Long John’). The construction of the tower and church was started in 1444. But the church was destroyed by an explosion in 1787. The tower survived the explosion which is strange because when you walk up to it, it’s a huge tower standing all by itself. Kinderdijk is about 15 km east of Rotterdam. I got there via Water Bus – which was fun. Kinderdijk was built around 1740 and is a systems of 19 windmills that were built to drain water from the land. This group of mills is the largest concentration of old windmills in the Netherlands. And here is this funniest thing I saw all week……while I was on the Water bus, I saw this man who took his Cat to Kinderdijk in a bag around his neck! Once we got off the boat, I caught up with him to see if I could take a pic. His cat seemed quite happy. I also got to do a bit of Crafting too……. Here I am with Lotte Noordzij-Walther. Lotte invited me over for Coffee and we ended up Crafting all afternoon. We each made a few things (that I will share soon). Lotte gave me this sweet Easter Card that she had made me. When I opened it, the Bunny spun around in the centre of the Oval. At the end of last year, my work offered an opportunity for a few staff members to take up Secondment assignments in Europe. I thought that it sounded like a wonderful opportunity so applied for it (not thinking it would happen to me)! Hahahaha! But it did happen….and now I am here in Europe! Who’d have thought! I am in Rotterdam, working in our office here until the end of May. Then I will be taking some time to travel and see the sites in a few countries before returning to Australia. How’s that for an adventure aye??? I arrived in Rotterdam on 15th March (a few weeks ago now) and was met at the airport by a work colleague. After giving me a quick tour of the office and city orientation they left me to explore the city for the weekend. My fav place so far……The Market Hall (Below). It’s a large food hall with the supermarket at the bottom. It’s kinda quite touristy but all the locals come here too. At lunchtime everyone in the offices comes here to get lunch. We come as a group and get what we want. I’m really enjoying trying all the new and different foods. I love the artwork. It’s always a busy place. And, see those windows in the roof??? – Well believe it or not but the outside of the building is all apartments. Cool huh? This is a Chocolate Shoe! Yeah – so that’s where I am. I will be checking in to share my adventures and hopefully sharing some craft moments with you too. Hi ya, here is the next Just Add Ink Challenge. It’s a Sketch Challenge that was suggested by Narelle. I made this for a friend who is turning 50 soon. 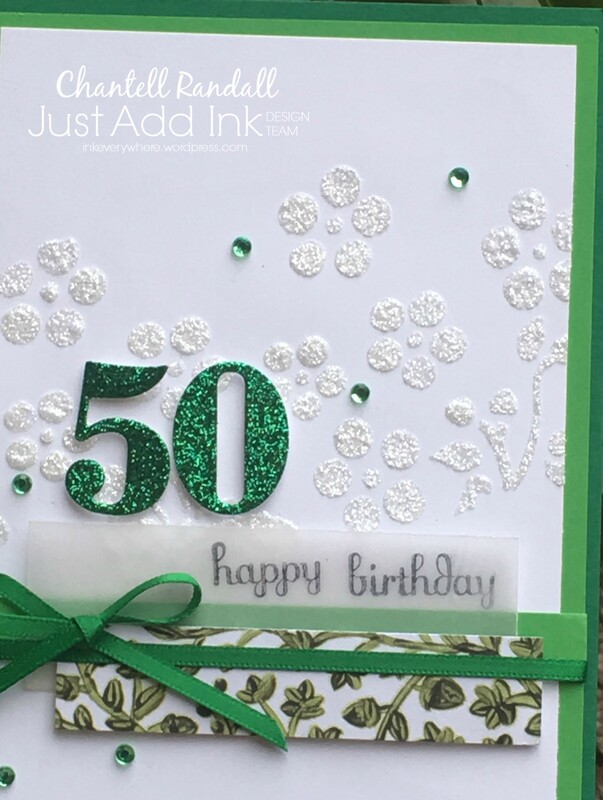 She loves the colour green so I used a number of different shades of green on my card. I used a glitter embossing paste to add some detail to the background. Head to Just Add Ink to join this challenge and/or to check out what the Design Team have put together to provide you with inspiration. Just Add Ink Challenge # 445 – Embossing. 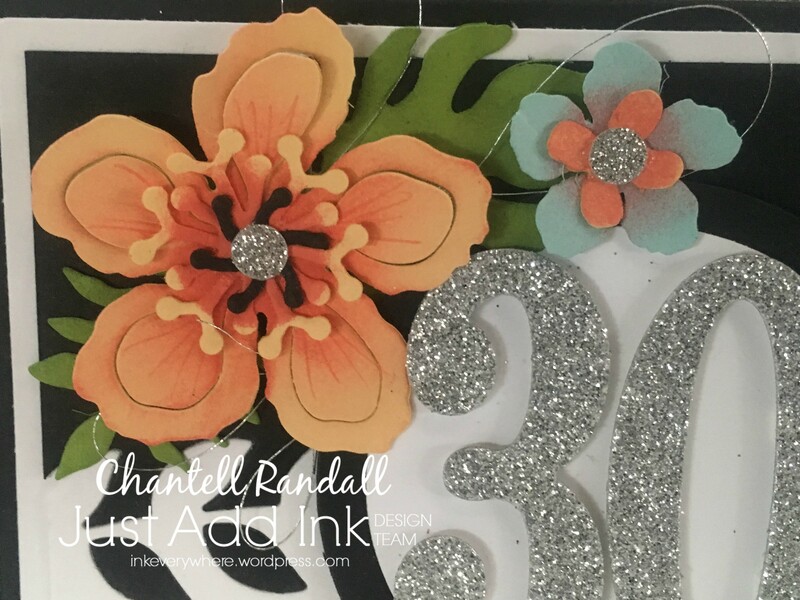 Here’s a fun challenge – Just Add Embossing. There are a few types of embossing you could add to your projects this week…….Dry embossing (using a Embossing Folder or Embossing by hand), Heat Embossing – so inking, sprinkling with powder and then heating is and Embossing paste (stenciled maybe). I used Heat Embossing and Embossing Paste on my card. I coloured the Embossing paste with a bit of Re-inker. Then I used the brick stencil with the Embossing paste t make the bottom panel. Next I Heat embossed the tools. 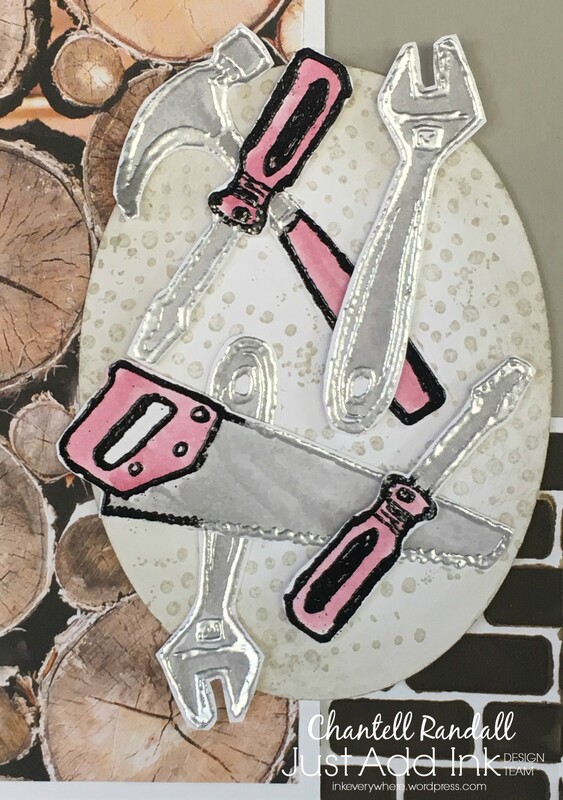 I actually used both silver and black embossing powder to get the two-tone tools. I like how the tools look so shiny. So join us for this Challenge – show us how you like to use Embossing on your projects. This week there is a Special Birthday happening in our family, so I used the Just Add Ink Sketch Challenge as the start for a Special Birthday Card. For this card, it was important to me to use the Black and White – as I see Black and White as National colours for NZ. Our Sports Teams wear Black and White, we are from the Land of the Long White Cloud and so I decided to incorporate Black and White into this card. Next I decided on Tropical prettiness as this card is for a beautiful young lady. Happy Birthday Ana! Check out the other Cards and projects made using this Just Add Ink Challenge Sketch here!